This Australian native is commonly referred to as red box tree in its home country; but you’ll most likely find it sold as silver dollar gum in the U.S. This unique species of tree is best known for its unique, crooked trunk growth, domed canopy and foliage color. Young round leaves are silver to gray-green, but turn a deep green as they mature. Mature leaves also take on a more elongated ovate shape. The attractive young foliage is often used in floral arrangements. From early spring through mid-summer, clusters of small white flowers appear, followed by pear shaped fruit. Bark starts off smooth but matures with a rough attractive texture. Plants tolerate a wide variety of soil conditions and pH levels and are resistant to major root rot diseases. However, they are susceptible to beetle borers. Plants can sometimes be slow-growing when young, but overall growth rates are fast to moderate compared to most trees. You can speed up its early growth by planting in fertile, well-drained soils and providing supplemental water. 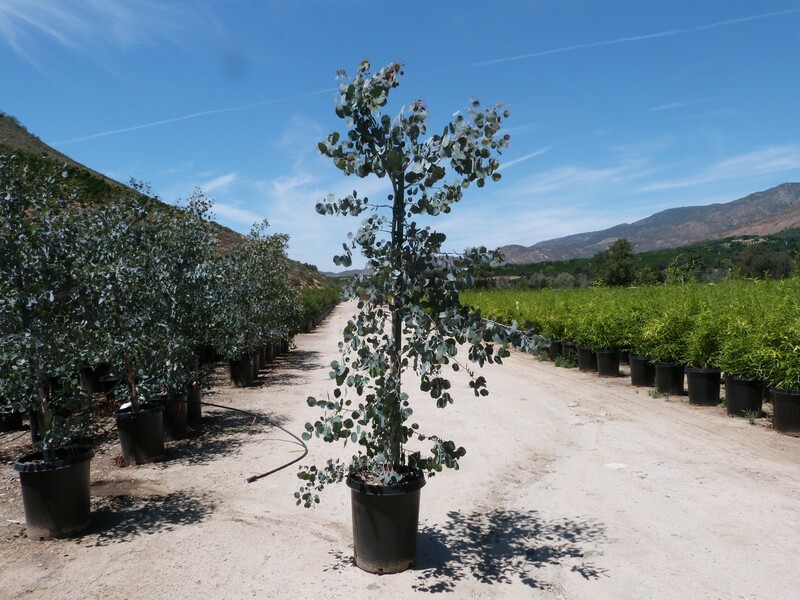 Silver dollar gum are known to be quite drought tolerant once they are established. Plants can tolerate full sun but also some partial shade. With its dense foliage and moderate size, red box works well as a privacy screen or wind-break. It’s also well-suited to street side and park plantings.